Winter, especially during Christmas, is a particularly busy time of year for most people. Whether that be down to work or at home, most of us find ourselves stressing around the winter period. For some people winter is extra stressful due to moving home – it has become a lot more common. 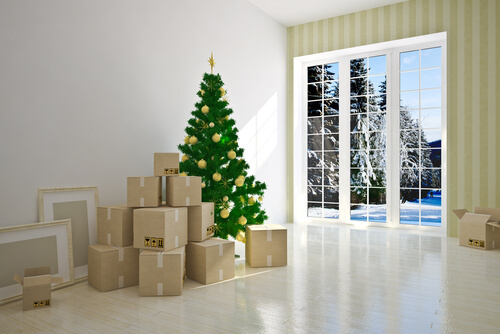 Read on to find out our best tips for when you are moving during the winter! The best way to take stress off your move is to be organised and stay on top of your schedule. We would highly recommend that you book and organise everything well in advance so that you are all ready to go on the moving day. Doing everything last minute will add unnecessary stress to the process, which no one wants to experience. Winter is also a busy time of year for many companies and organisations, so be sure to sort everything out well ahead of time! The weather can be extremely unpredictable during winter, so make sure you are prepared. The UK is also known to have quite unforeseeable winters. From snow to rain, disruptions can happen due to the adverse weather conditions. If you are planning to move to a new house during this season, be sure to have contingency plans in place in case you come across issues with the weather. Don’t move alone – let a removals company help you. Moving to a new house is stressful enough as it is, and taking everything on yourself can be a huge handful. A removal company removes all of this stress and also means you’ll have more time to get everything ready. Your removal company will also schedule in everything, giving you the freedom you need to carry on with your usual daily tasks in life. Before packing up your general belongings, it’s always a good idea to pack up a small box full of your essentials. Whether it be your toothbrush or a phone charger, keeping all your essential items together will make your life much easier during the move. You’ll be able to easily find the items you need the most, rather than looking through everything you own. It might also be worth putting the non-essentials into storage if you aren’t going to need them for a while. You can also take advantage of your removal company’s packing services if they offer them. Instead of spending hours collecting your belongings and packing them, the removal company can do this all for you. Although this usually comes at an additional cost, it is definitely worth the extra money. They’ll also provide the packing materials and ensure everything is secure when loaded onto the removal lorry or van. It is likely that your new house will be pretty chilly when you arrive – so get the heating on! As soon as you arrive at the new property, turn the heating on and get the kettle boiling. Also, check that your radiators are turned on. Especially when temperatures drop to below sub-zero, it’s highly important that you stay warm. For houses that haven’t been inhabited in a while, the house is usually a lot colder. We hope that you have found our tips useful – if you have any further questions or tips yourself then please do not hesitate to get in contact! If you are looking for a reliable removals company then perhaps consider Quicksilver Moving & Storage, based in Newcastle. We have over 30 years of experience in the business and have moved many people during the winter over the years. We put the right processes in place to ensure that your move during the winter is successful and without any issues.